Saturday Night Live skits--Phil Hartman playing a gluttonous former President Clinton in 1996-- Perhaps you remember this skit from "olden days" of SNL. Is he a national symbol of an American fast food habit that is leading to increasing incidence of diabetes? The word diabetes means urine, and the word mellitus means sweet. Diabetes is a condition in which the patient urinates frequently due to a buildup of solutes in their blood. Diabetes mellitus (which has two forms--Type 1 and Type 2) is a condition which causes the patient to urinate frequently, but the urine is sweet because the solute present is glucose that did not get broken down in the blood. This happens because of either a resistance to insulin or the absence of insulin in the blood. Type 1 Diabetes occurs when the patient produces either ineffective insulin or none at all. This condition is generally hereditary and is developed from a young age. Therefore it is often referred to as juvenile-onset diabetes. Type 2 Diabetes occurs when the patient's immune system develops a resistance to its own insulin. Therefore, the insulin is present but not used. The resistance often happens as a result to an overexposure to glucose in the diet (i.e., overeating that often times leads to obesity). Type 2 Diabetes is usually developed by adults (hence "adult-onset"), but with the increasingly sedentary, food-centered lifestyle that Americans have become accustomed to, it is now being developed by children as young as five. A chemical produced by the pancreas that is necessary to break to glucose in the blood. A statistical relationship between two variables (e.g., between the prevalence of diabetes and obesity). A correlation is measured as R². The closer R² is to | 1 |, the stronger the correlation. Overall, you will be plotting variables against time and then against one another, fitting the resulting graphs with trend lines that generate a correlation value and equation, and then using these tools to predict future trends. Include in your data sets statistics from 1980 on. Hint: Think first about which variable (i.e. obesity or diabetes) is the dependent one, and which is the independent one. First graph both variables as dependent on time. Add trend lines that show both the equation of the lines and the correlation value (R²). Use the diabetes vs. time graph to predict the prevalence of diabetes in the years 2010, 2020 and 2030. Then graph both variables against one another, and add a trend line as above. Use the values you just predicted for diabetes prevalence in the future in your diabetes v. obesity equation to predict the prevalence of diabetes in 2010, 2020 and 2030 as a function of obesity alone. Plot graphs that show the current rate of growth for each of these variables, and plot the two variables against each other as well. McDonald's growth statistics are not extensively reported within the United States, so it may be wise to use the worldwide statistics instead. Using the trend line for the McDonald's graph, predict the number of McDonald's franchises that will be present in 2010, 2020, and 2030, given the current rate of growth. Then use these extrapolated values in you diabetes vs. fast food outlet equation to predict the prevalence of diabetes in 2010, 2020, and 2030. You may want to go beyond simply describing the differences in the numbers; graphing all three of the predicted trends (i.e., diabetes prevalence v. time) through 2030 on the same graph may help. Listed below you will find links to key data that you are to manipulate in order to solve the questions. If you would like to know more about diabetes, your chances of getting diabetes, or how you can prevent getting diabetes in your lifetime, you may want to visit a few of the sites linked below. Students should use statistics for "Number of Persons Diagnosed with Diabetes, 1980-2000" for their diabetes prevalence raw data. On the CDC Diabetes Statistics Index his is found under "Prevalence of Diabetes, U.S. Population." After getting to this page, students need to click on "Data for Figure" to get to the raw data. The students should copy and paste this data into an Excel spreadsheet. Students will then need to plot a graph of Diabetes Prevalence vs. Time (years). They can then fit the resulting curve with a trend line that will automatically generate an equation for the line as well as a correlation (R²) value. Students will then need to retrieve the raw data for the U.S. obesity statistics. From the CDC's Obesity Statistics Index, this page can be found by clicking on "Prevalence of Diabetes Among U.S. Adults, by Characteristics, 1991-2001." The data table presented displays obesity statistics for various characteristics (gender, ethnicity, age, etc.) as percentages of the U.S. adult population. Students should extract the "total" data from the table and paste the data in a new column in their existing Excel spreadsheet. (You may notice that this data is not ideal because it only goes back to 1991, it doesn't give data for each consecutive year, and it only includes adults in its estimate). Students should graph both Obesity Prevalence vs. Time (on the same graph as Diabetes vs. Time) and Diabetes Prevalence vs. Obesity Prevalence (individual plot). Again, fits with line equations and correlation values should be shown. Students can answer how strong of a correlation there is between diabetes (dependent) and obesity (independent) by using the correlation value they found for their Diabetes Prevalence v. Obesity Prevalence plot. Students can use the equation from the Diabetes Prevalence v. Time plot to predict the prevelence (in millions of people) of diabetes in the years 2010, 2020, and 2030. These numbers represent the prediction based solely on the current rate, with no other contributing factors (such as obesity or fast food prevalence) affecting the rate of increase. If they'd like, they can graph this extension. Students should use the Obesity Prevalence vs. Time line equation to predict the future prevalence of obesity in 2010, 2020, and 2030 given the current trend. Students can then plug these values for obesity into their equation for Diabetes Prevalence v. Obesity Prevalence to predict the prevalence of diabetes in 2010, 2020, and 2030 based on obesity as the sole contributing factor. Click here to see the Excel spreadsheet. Students will already have the diabetes statistics they needs in spreadsheet form. To this spreadsheet, they will need to add data for the number of McDonald's worldwide (this is only necessary to retrieve for the years 1980 and beyond. This data will have to be manually picked out from the text of the McDonald's Corporate Timeline. Students can express the rate of growth of McDonald's franchises (used in this project to represent the fast food industry) in graph form (i.e., Number of McDonald's Outlets vs. Time). They should then fit this line and display the automated equation and correlation value. Students should also graph Diabetes Prevalence vs. Number of McDonald's Outlets, and they should derive the equations and the correlation as above. Students should use the equation from the McDonald's vs. Time graph to predict the number of franchises that will be present, given the current rate of growth, in the years 2010, 2020, and 2030. Students will then put these values into the equation for the Diabetes Prevalence vs. Number of McDonald's Outlets graph in order to predict the prevalence of diabetes in the future as solely dependent on size of McDonald's (fast food) industry. Students should graph the three different predictions of diabetes prevalence vs. time. The three sets of prevalence of diabetes predicted by each independent variable should look similar, but not the same. The students should use their graph (and the slopes of the lines) to explain which set they think is closest to accuracy. In their analysis, the students should also consider such factors as data limitations (e.g., limited amount of data, compared data from inconsistent or incompatible sources, etc.) as well as the biological factors involved (e.g., the different types of diabetes and their causes, the various factors involved in getting diabetes of both types, etc.). Present raw data in a single Excel spreadsheet. Create the appropriate plots (as shown in the Analysis section above) and display the equations and correlation values for each line. Give a definitive answer to the first portion of both Question 1 and Question 2: Is there a correlation (determined by how close R² is to | 1 | ) between diabetes prevalence and obesity prevalence and between diabetes prevalence and the growth of the fast food industry? Use the appropriate equations to predict the prevalence of diabetes in 2010, 2020, and 2030. Students should present this data in an Excel spreadsheet; by entering the equations into the table, the students should not have to do any calculations by hand. Provide a written explanation as to why the predictions of diabetes differ when the independent variable changes. In their analysis, students should include numerical evidence and should explain discrepancies by both data and biology. What other nationwide health epidemics (e.g., heart disease, colon cancer, etc.) are correlated to the fast food industry? 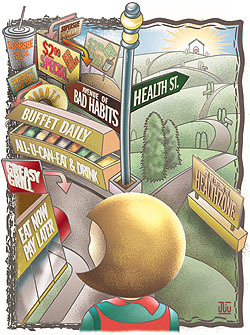 Has the health food craze in the last decade benefited our health? Would the findings of this project be any different if the McDonald's statistics represented American franchises only? Is the Americanization of European and other countries around the world leading to an increase in diabetes in these places? Type 2 Diabetes has been shown to have a much higher incidence in certain ethnic groups in the United States such as American Indian, African American, and Hispanic. Is the increasing proportion of these minorities in our population affecting the diabetes statistics presented by the CDC?